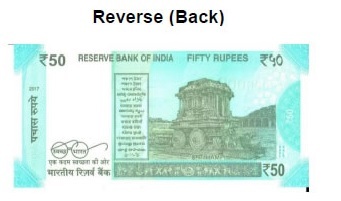 The Reserve Bank of India has announced its plan to shortly introduce a new banknote of Rs.50 denomination. 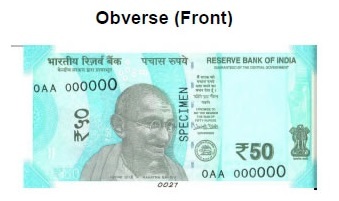 As per the notification issued on Aug 18, 2017, RBI has stated that the base colour of the new currency note of Rs.50 would be Fluorescent Blue. And, as a measure to depict India's vast cultural heritage, the note will have a motif of 'Hampi with Chariot' on the reverse side. To be issued under the Mahatma Gandhi (New) Series, this new note will bear the signature of the present RBI Governor Dr. Urijit R. Patel. The salient features of this new Rs.50 currency note are detailed below. The size of the banknote will be 66 mm x 135 mm. 1. There will be a see-through register, with the denominational numeral of 50. 2. The note will have denominational numeral ५० in Devnagari too. 3. Centre of the note will depict the portrait of Mahatma Gandhi. 4. It will carry micro letters ‘RBI’, ‘भारत’, ‘INDIA’ and ‘50’. 5. You will also find a windowed demetalised security thread, with inscriptions ‘भारत’ and RBI. 6. Towards the right of the Mahatma Gandhi's portrait, would be the Guarantee Clause, Governor’s signature with Promise Clause and the RBI emblem. 7. The right end of the note will feature the Ashoka Pillar emblem. 8. Another aspect of the Rs.50 banknote, would be the watermarks of Mahatma Gandhi portrait and electrotype (50). 9. The number panel — with numerals growing from small to big — will feature on (i) the top left side and (ii) bottom right side. 10. On the left side of the note, you will find the Year of printing. 11. Left bottom of the note would depict the Swachh Bharat logo with slogan. 12. Language panel would feature in the centre of the note. 13. Next to the language panel, the motif of 'Hampi with Chariot' would be printed. 14. On the reverse side too, there would be the denominational numeral ५० in Devnagari. Meanwhile, RBI has stated that the earlier series of Rs.50 denomination banknotes will continue to be a legal tender.